In IEEE Transactions on Multimedia 2010. This paper describes a novel method for browsing a large video collection. 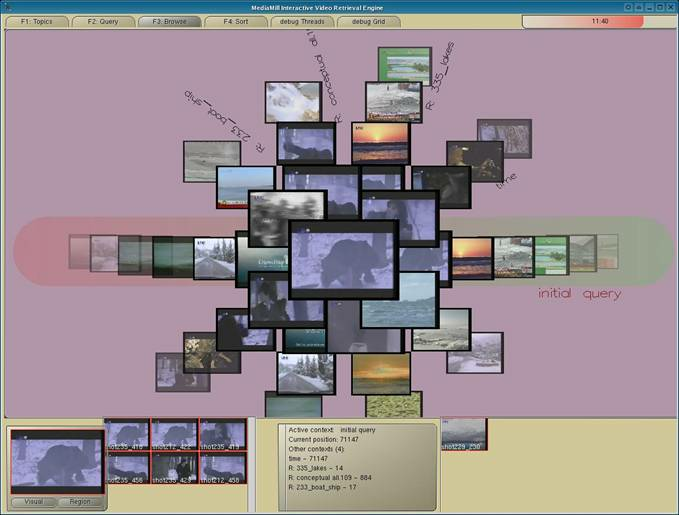 It links various forms of related video fragments together as threads. These threads are based on query results, the timeline as well as visual and semantic similarity. We design two interfaces which use threads as the basis for browsing. One interface shows a minimal set of threads, and the other as many as fit on the screen. To evaluate both interfaces we perform a regular user study, a study based on user simulation, and we participated in the interactive video retrieval task of the TRECVID benchmark. The results indicate that the use of threads in interactive video retrieval is beneficial. Furthermore, we found that in general the query result and the timeline are the most important threads, but having several additional threads improves the performance as it encourages people to explore new dimensions.